Women's Final Four: Powerhouse Teams Match Up : The Two-Way The undefeated Connecticut and Notre Dame could meet in a record-setting final Tuesday, if they can get past Stanford and Maryland, respectively, today. All four programs have won past titles. 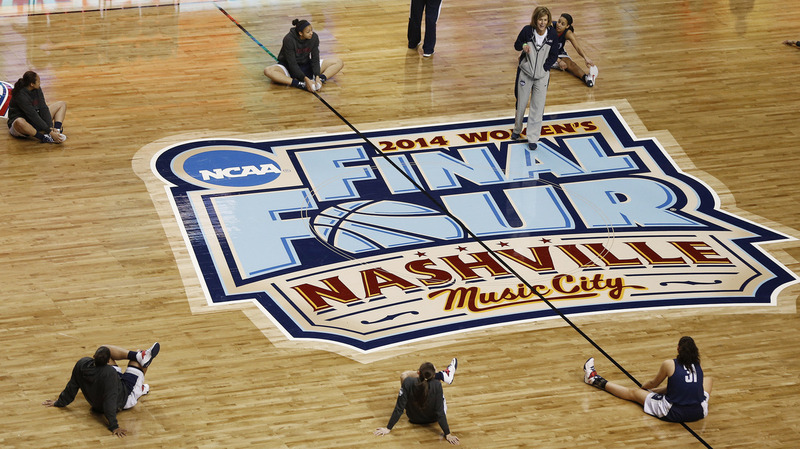 Connecticut players stretch during practice on the court hosting the women's Final Four in Nashville. The games tip off today with a 6:30 p.m. ET start time. Two undefeated teams are still alive in the women's NCAA basketball tournament – and they could meet in a record-setting final Tuesday, if Connecticut and Notre Dame can get past Stanford and Maryland, respectively, on Sunday. The four programs have all won national championships in the past. Maryland vs. Notre Dame: 6:30 p.m.
Stanford vs. UConn: 9:00 p.m. Both of today's games are rematches of contests from earlier this season. Hosts Connecticut beat Stanford by nearly 20 points back in November, and Notre Dame held on to beat Maryland on the road in January. But as all four coaches would surely tell you, everything's different in the tournament. And Notre Dame is forced to cope with a troubling change: the loss of senior forward Natalie Achonwa, who averaged nearly 15 points and almost 8 rebounds a game this season. The 6'3" Achonwa hurt her knee near the end of the Irish's win over Baylor Monday. After leading the NCAA in scoring offense this season, Notre Dame has scored more than 80 points in every tournament game it played. All four teams will put a first-team AP All-American on the floor today: Connecticut has Breanna Stewart and Stanford has Chiney Ogwumike, while Notre Dame has Kayla McBride and Maryland has Alyssa Thomas. "Without question, they are the five best players in America right now," UConn coach Geno Auriemma said of a group that also includes Baylor's Odyssey Sims, "and fortunately, no one has to play against that five." Stanford's Ogwumike "is the only player in the country to rank in the top 10 nationally in scoring (26.4 ppg), rebounding (12.1 rpg), field-goal percentage (60.4) and double-doubles (26) entering the Final Four," the NCAA says. In her career at Maryland, senior Alyssa Thomas has put up 66 double-doubles, along with six triple-doubles. She had 29 points against Notre Dame earlier this year, racking up a double-double against the Irish. UConn's Breanna Stewart, a sophomore forward who can also bring the ball up the court, was named the AP Player of the Year Saturday. She "leads the Huskies with 19.4 points per game and ranks second on the UConn roster in rebounding with 8.1 boards per contest," according the school's site. It adds, "Her 738 points this season are fourth most in program history." Notre Dame senior guard Kayla McBride, also known as K-Mac, "has started all 36 games for Notre Dame this season," her school website says, "registering career highs of 17.2 points, 5.2 rebounds and 3.9 assists per game with a 1.89 assist/turnover ratio, while posting 12 20-point games." For the second year in a row, Notre Dame's Muffet McGraw was named the AP Coach of the year.